Our Price $83.85 Another currency? 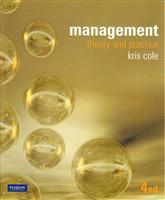 Management - Theory and Practice by Kris cole has been thoroughly revised to give you the prav\ctical information and theoretical grounding you need to thrive as a modern manager. Each of the four parts are written with competency and training in mind and solidly underpinned by relevant management and organisation theories. Includes numerous excercises, activities and tips. Developing, managing and monitoring operational plans.